Though the title is Not a Drop to Drink, I found that this book quenched my thirst for a great dystopian. A distinct and captivating novel about a young girl’s story of survival. Lynn has been taught by her mother to trust no one. Especially not men. She has been trained to defend their home and their only water source all of her life. Shoot to kill, no questions asked. It’s a tough way to live, but a good way not to die. When tragedy strikes, Lynn must do the unthinkable: learn to trust another person… and most importantly, her heart. 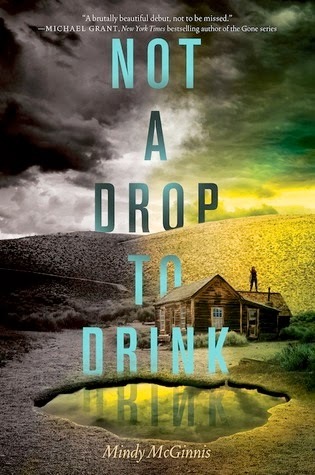 Not a Drop to Drink is one of the most realistic dystopians I’ve read in the sense that I could really imagine the things that transpire in this novel unfolding in a distant future. That alone made the story frightening, and it was chilling to see what desperation could drive some people to do. I was drawn into Lynn’s story from the very beginning, fell in love with certain characters along the way, and shed more than a few tears near the end. I very much look forward to continuing the series with In a Handful of Dust, which takes place ten years in the future. This installment may not have had the happily-ever-after I originally envisioned, but that’s okay… because sometimes, that’s life. The important thing is to find inspiration and empowerment in those endings; and thanks to Lynn, I definitely did. Okay you have me very very curious about this one.... I remember wanting to read it but then I kinda forgot about it but now I am all interested again... but you worry me with that mention of the ending... we are going to have to discuss haha. Great review Wifey! I keep seeing tis one aroudn, but I havent' felt compelled to jump in and try it. I do like that is very realistic and could happen. I really need to just pick it up and give it a go. This book sounds like exactly what I would read - I added it to my to read shelves. I love dystopian novels xD thanks for an amazing review! I own this Michele and need to read it. It's the concept of no water that trips me up. I mean how will I make my coffee? I need to read this book so bad. Not going to lie, it kind of freaks me out with the drought around here. lol. I enjoy a good dystopian and this sounds like a winner. :) I like the way you described this one and it sounds like a great book! Thanks for sharing.